Young Jewish doctor Joel Fleischman (Rob Morrow) attended medical school thanks to financial support from the state of Alaska. To repay the loan, he’s obligated to practice in Anchorage for four years but ends up reassigned to the small and remote town of Cicily. 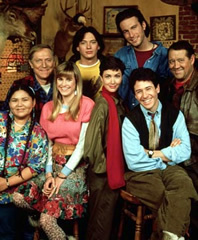 The community’s odd and easy-going characters include former astronaut Maurice Minnifield (Barry Corbin), former felon Chris Stevens (John Corbett), beauty pageant winner Shelly Marie Tambo Vincoeur (Cynthia Geary), bar owner Holling Vincoeur (John Cullum), mild-mannered Ed Chigliak (Darren E. Burrows), general store owner Ruth-Anne Miller (Peg Phillips), Native American receptionist Marilyn Whirlwind (Elaine Miles), and bush pilot Maggie O’Connell (Janine Turner), who develops an ongoing love-hate relationship with Joel.